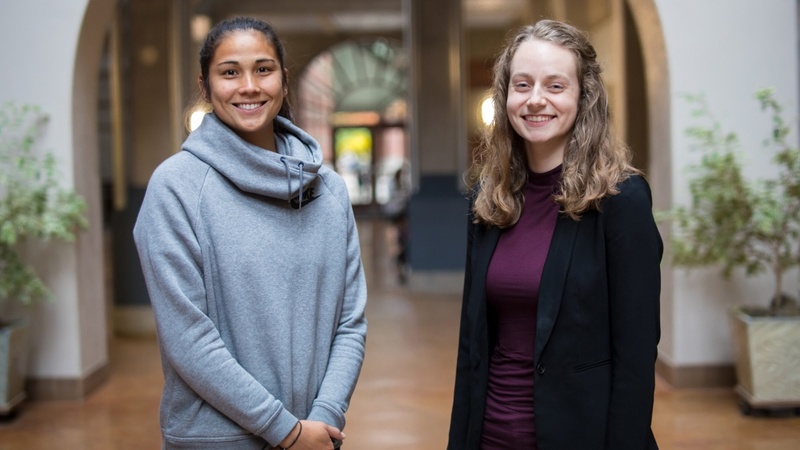 This month, a UO student and an alumna are preparing to compete with elite students across the country as finalists for two highly prestigious postgraduate scholarships. Caitlyn Wong is a candidate for the Rhodes Scholarship and Sandra Dorning for the Marshall Scholarship. If they win, their postgraduate studies will be across the pond: Wong at the University of Oxford and Dorning at the university of her choice in the U.K.
Wong is a biochemistry major on track to graduate this December. An ambitious 4.0 student, she was a captain of the UO soccer team, worked in the evolutionary biophysics lab of professor Mike Harms and fundraised tens of thousands of dollars for the St. Baldrick’s Foundation in her spare time. She is considering pursuing a doctorate in medicine. “I ideally want to be a pediatric oncologist and study childhood cancer and work with patients that have childhood cancer,” she said. Dorning was a marine biology major who graduated in June 2017. She interned for the National Oceanic and Atmospheric Administration in 2015 as part of the Ernest Hollings Distinguished Scholarship Program. After graduating, she worked first as a summer intern and then as a research technician in the biology lab of UO professor Kelly Sutherland. She’s interested in international marine policy related to fisheries management. Josh Snodgrass, associate vice provost for undergraduate studies and director of distinguished scholarships, was in charge of endorsing the now-finalists’ scholarship applications. It was the day before Wong’s last soccer home game when she found out that she was a finalist for the Rhodes Scholarship. She was out to dinner with her parents and several friends. Dorning was also with her family when she received her potentially life-changing email. They were ecstatic. As finalists for their respective scholarships, Wong and Dorning will each face an interview in front of unknown panelists. They could be asked about a variety of topics ranging from their personal histories to current events related to their research interests. Snodgrass is preparing Wong and Dorning by creating two mock interviews for each candidate. Just like the real panels, Snodgrass’ will feature panelists who understand the finalists’ specialties but also people from different backgrounds. Wong is a Clark Honors College student, and Dorning is an alumna. At the honors college, both found respite from their heavily science-based workloads by exploring interests in other subjects. Both candidates developed their honors college theses at UO research labs. “I’m just really grateful for all the opportunities I was able to capitalize on at the university because that has helped me reach where I have in this competition, and I think the opportunities here for undergrad research are just amazing,” said Dorning. According to Snodgrass, undergraduate research is key to making UO students competitive in the battle for distinguished postgraduate scholarships. Wong’s interview will take place in Seattle; Dorning’s will be in San Francisco. As their interview dates approach, both Wong and Dorning feel cautious confidence, but neither will be crushed if things don’t pan out.